About 35 million people develop chronic sinusitis each year, making it one of the most common medical complaints in America. Taking care of the nose and sinuses is one of the primary expertise of the otolaryngologist. At ENT Specialists of Abilene, we specialize in adult and child nasal and sinus disorders. This includes (but is not limited to) the treatment of Congestion, Allergies, Chronic Sinusitus, Deviated Septum, Nasal Obstruction, Nosebleeds, Post Nasal Drip, Recurrent Bacterial or Fungal Sinus Infections, Nasal and Sinus Fractures, Smell and Taste Disorders, Snoring and Sleep Apnea, Nasal Masses, Skin Lesions, and much more! Millions of Americans suffer from nasal allergies, commonly known as hay fever. Often fragrant flowers are blamed for the uncomfortable symptoms, yet they are rarely the cause; their pollens are too heavy to be airborne. An ear, nose, and throat specialist can help determine the substances causing your discomfort and develop a management plan that will help make life more enjoyable. The most appropriate person to evaluate allergy problems is an otolaryngic allergist (ear, nose, and throat specialist with added training in allergy). Aside from gathering a detailed history and completing a thorough examination of the ears, nose, throat, head, and neck, in order to evaluate the sinuses to determine if infection or structural abnormality (deviated septum, polyps) is contributing to the symptoms, the allergy doctor will offer advice on proper environmental control. In addition, the doctor may advise testing to determine the specific allergen(s) that is causing problems. This is generally done by skin testing but also blood tests and patch tests are also available. Our Allergy and Sinus Doctors will perform a complete exam and often evaluate your nose and sinuses in the office with an endoscope (a small lighted telescopic tube) and/or obtain a CT scan of your sinuses with our state of the art MiniCT Scanner allowing you and your doctor to see what is going on in just minutes. Balloon Sinuplasty (or Balloon Sinus Surgery) is a safe and effective procedure for chronic sinusitis patients who are not responding well to medications and are seeking relief from uncomfortable and painful sinusitis symptoms. With sinus surgery, the goal is to open blocked sinus passages in order to allow the sinuses to drain freely and before 2005, this was accomplished with traditional sinus surgery in which sinus tissue and bone would be removed in order to make the passages larger. In 2005, balloons were introduced as a way of dilating these sinus passages to enlarge the drainage pathways. With Balloon Sinuplasty, ENT doctors open inflamed sinuses in the same way that heart surgeons open up blocked arteries during balloon angioplasty. The procedure is less invasive than traditional sinus surgery, since the balloon is dilating the tissue rather than removing it. In the last few years Balloon Sinuplasty has become a widely used solutions for sinusitus, and ENT Specialists of Abilene has performed many of these in-office procedures. Interested in learning more about Balloon Sinuplasty, and whether you could be a candidate? What are the Benefits of In-Office Balloon Sinus Surgery? Unlike traditional sinus surgery, balloon sinus surgery does not require general anesthesia nor are the removal of bone and tissue from sinus passages. This means the procedure can be done in our Abilene office, often with just local anesthesia. Recovery time is short and many of our patients report resuming their normal activities the same day of the balloon dilation procedure. Balloon Sinus Procedure opens passages, restores drainage and delivers immediate relief for sinusitus sufferers. Many patients report instantly being able to breathe ‘normally’ for the first time in years! Over 95% of patients who’ve had the procedure say they would have it again. If you have been diagnosed with chronic sinusitis and are not responding well to antibiotics, you may be a candidate for sinus surgery. This is a much less invasive option used by ENT Specialist of Abilene doctors to treat chronic sinusitis that is clinically proven to be safe, effective and improve the quality of your life. The inability to breathe through the nose is a problem that affects hundreds of thousands of people. It is often due to multiple factors, but many of these can be easily addressed with medications, office based procedures, or a simple surgery. Deviated Septum – One common cause of nasal obstruction is a deviated septum. The septum is the portion of your nose that divides it into a right and left side. The septum is made up of cartilage and bone, and is covered by a mucosal lining. A septal deviation is usually related to some sort of trauma to the nose. This trauma can occur as early as birth (while traveling through the birth canal) and many people can’t remember any injury even occurring. If the septum is deviated it will normally cause a nasal obstruction that affects one side of nose more than the other, and the severity of obstruction normally does not fluctuate. The only way to address a deviated septum is surgery to remove the deviated portions of the septal cartilage and bone. This surgery is typically very successful and greatly improves a patient’s ability to breathe through their nose. Congestion or Enlargement of Inferior Turbinates – Another common cause of nasal obstruction is hypertrophy or enlargement of the inferior turbinates. 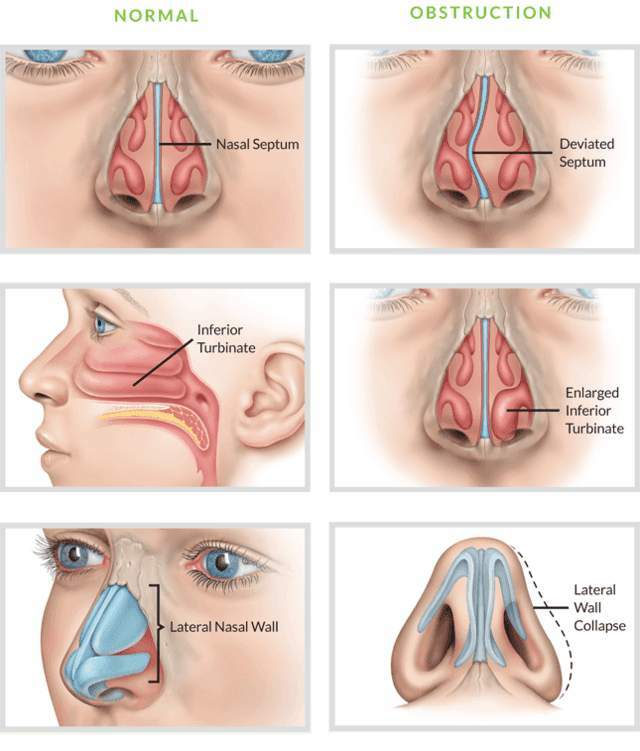 The inferior turbinates are the tissue that comes off the side wall of the nose and runs along the floor of the nose, which is the area where we want to move air when we breathe through our nose. The inferior turbinates are the tissue that becomes congested with someone has a cold, sinus infection, or allergies. The severity of the obstruction can wax and wane as this tissue becomes congested and then decongests. The obstruction may alternate from side to side throughout the day or night. Often turbinate hypertrophy and congestion can be adequately treated by using a daily nasal steroid spray such as Flonase or Nasacort. For turbinate congestion that is not responsive to medications, a quick and simple in office procedure can often be performed to address the issue. Weak Cartilage – The lower portion of our nose is made up of cartilage that is covered by skin. This cartilage forms the outer wall of our nose and helps to keep our nose open. If this cartilage is weak it can cause the outer wall of our nose to collapse inward and narrowing our nasal airway. This is another common cause of nasal obstruction. A Breathe Right Strip helps to reverse this collapse and keep the nose open even if the nasal cartilage is weak. There is now an implant that can be easily inserted underneath the skin and over the nasal cartilage to keep the nose open. It basically acts as an internal Breathe Right Strip to permanently support the nasal cartilage and keep the nose open. The implant is small, not visible, and is absorbed by the body after 18 months. If you suffer from frequent or constant nasal obstruction there are many treatment options available to give you relief. The physicians at ENT of Specialists of Abilene are well qualified to evaluate and treat these issues. Please call for an appointment today if you are tired of nasal obstruction.